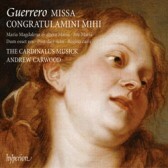 The main work on this disc is the gloriously sunny and joyful Missa Congratulamini mihi. Based on an Easter motet by Crecquillon (also recorded here), it is full of the voluptuous exuberance of the Paschal season. The five-part texture, with two treble parts, adds to the shining sound. Also included are a number of Easter motets. Maria Magdalena et altera Maria and Post dies octo are highly descriptive, narrative works, highly contrasted in mood and texture. The four other pieces on this disc show various facets of Guerrero’s mastery. Dum esset rex (in honour of Mary Magdalene) is similar to a spiritual madrigal whilst the eight-part Ave Maria is a sonorous double-choir plea to the Virgin.